Knitting Entry into Fiber Fair – CHECK!!! 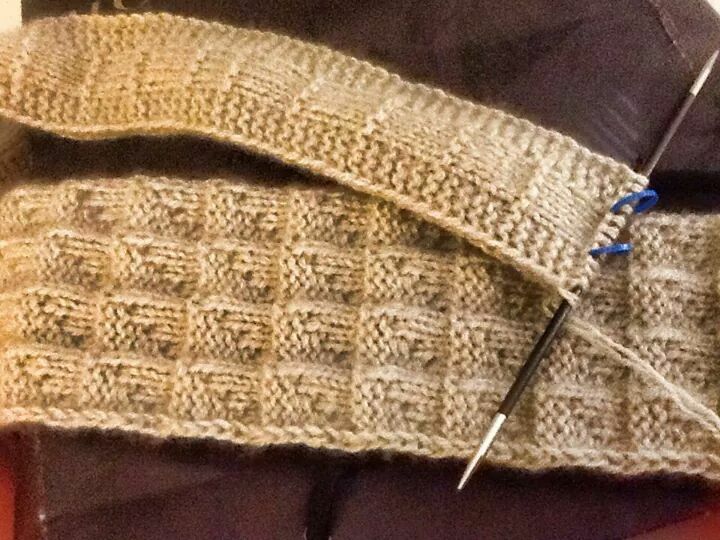 I just finished knitting the tie that my hubby requested as his first father’s day gift. (Ugh, I am terrible with deadlines!) There is no one more knitworthy in my life than him. He sees how much time and effort I put into the things I make. He enjoys and takes good care of the knitwear I gift to him (I’m surprised his socks are still holding up!). And unlike the dog and the baby, who have no idea as to what is going on, he appreciates the handmade items. So when he asked for a knitted tie, I was so happy to oblige him that I busted out the fancy cashmere yarn to fulfill his request. All he asked was that the tie be a solid color so he could easily pair it with his striped work shirts. PS: Did you know that some designer brand cashmere ties can sell for over $200!? So don’t feel bad if you have to splurge on the yarn, you’re getting a very good deal! 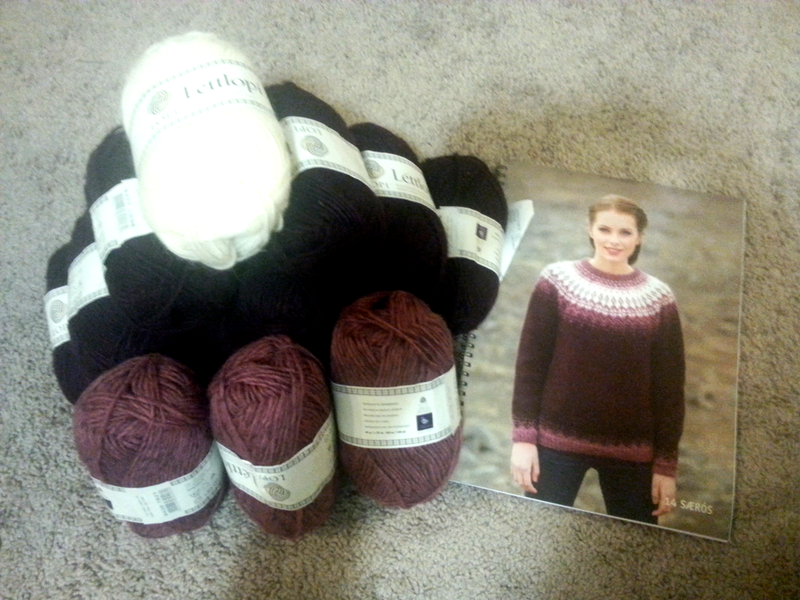 A friend of mine just got back from a trip to Iceland and was kind enough to buy me a beautiful book with traditional patterns and enough yarn to make one of the sweaters! I am so excited!! I cannot wait to get to get started on this project, but I am going to wait until I finish the sweater I currently have on my needles. Another project I’ve started today was my stash organization. I got these shelves free from Craigslist so that I can empty out my craft closet. My apartment complex promised to install a washer and dryer in my hall closet back in April, since it’s now September I don’t think it’s actually going to happen, but I am still going to to organize my stash. The easiest first step I already did was move all of my library to the bottom two right shelves. I also gave up some precious real-estate on the bottom left shelf for our collection of cookbooks. 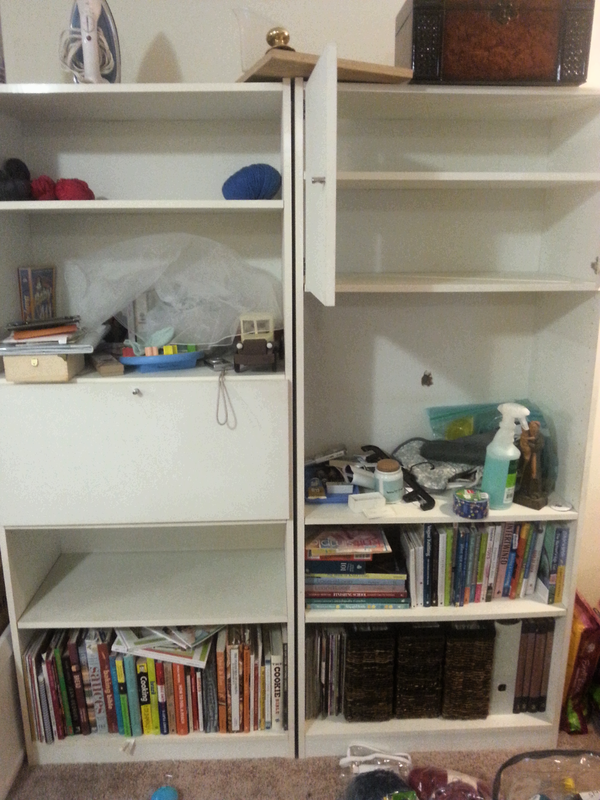 Here is the before photo, I will post an after photo once I figure out how I plan to organize it.